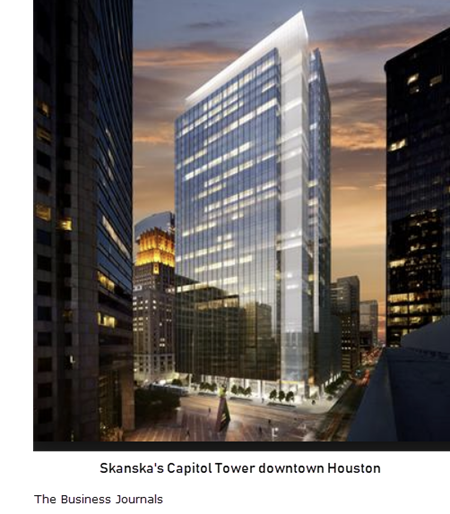 ​ HOUSTON – Quantum Energy Partners will relocate its headquarters to the top floor of Skanska's Capitol Tower—a 750,000-sf office building that broke ground earlier this year in downtown. The Capitol Tower, 800 Capitol St​., is valued at $360 million. The private equity company will occupy the 35th floor, which has 32,000 sf of office space, per a Skanska announcement. The building will be named after its anchor tenant, Charlotte, North Carolina-based Bank of America Corp., which preleased 210,000 sf of office space in the building. Capitol Tower's new name will be announced upon its completion in 2019. Bank of America will occupy six-and-a-half floors in the building.